Based in Toronto, Harmony Marketing is a full-service agency that handles everything from strategic marketing and development plans and government relations to corporate and media partnerships. The team, which describes itself as “small but mighty,” has become a key player in some of the city’s most high-profile events, such as Sail-In Cinema, Fashion Cares 25 and many others. Some stories are pretty hard to ignore -- especially when they’re about a giant inflatable duck that becomes a lightning rod for both fascination and criticism from a wide range of observers. As Harmony Marketing discovered, though, there are ways to turn even controversial issues into good news stories, particularly when you have the reach and reporting capabilities provided by Cision. The Redpath Waterfront Festival, which ran July 1-3 in 2017, was an opportunity to capitalize on the interest and excitement around the 150th anniversary of Canadian confederation, as well as the 150th anniversary of the founding of the Province of Ontario. While it normally requires something special to draw a crowd to the Festival -- such as the Tall Ships which visit every three years -- the team had something truly novel to promote this time around: the world’s largest rubber duck, a 61-foot tall, 30,000 lb spectacle that stood approximately six stories high. In the initial coverage, however, a major newspaper published a story which took some comments out of context about the level of government funding to rent, transport and set up the duck on Toronto’s waterfront. This resulted in a wave of stories criticizing the entire initiative. While the coverage was huge -- Harmony Marketing tracked close to 1,000 stories based on an initial news release -- it obviously wasn’t entirely the kind of media attention the team wanted. 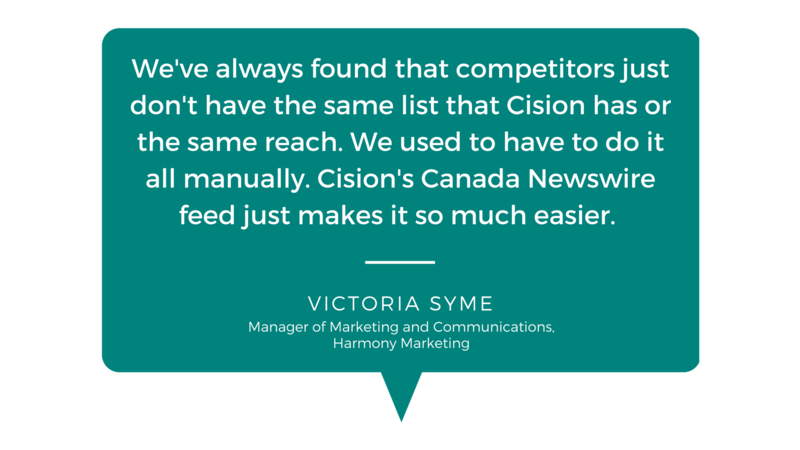 Harmony Marketing used Cision’s distribution service (powered by Canada Newswire), which offers a distribution platform that reaches more than 4,000 local media outlets and more than 10,000 others around the world. Cision’s targeting, monitoring, and marketing solutions also include the ability to distribute multimedia assets such as photos and videos. Harmony Marketing's strategy wasn’t limited to an initial awareness-building news release about a (giant) rubber duck. In fact, over the course of promoting the Redpath Waterfront Festival, the team used half a dozen news releases and advisories to share more information about the event, including details about the real numbers, and correct information, behind the duck. These releases received over 21,000 views and hits, with multimedia assets garnering more than 59,000 views, reaching a total potential audience of 87 million people. This year's Festival made more than 310 million impressions, a 151 percent increase from last year. Almost three-quarters (71 percent) of all impressions came from earned media. 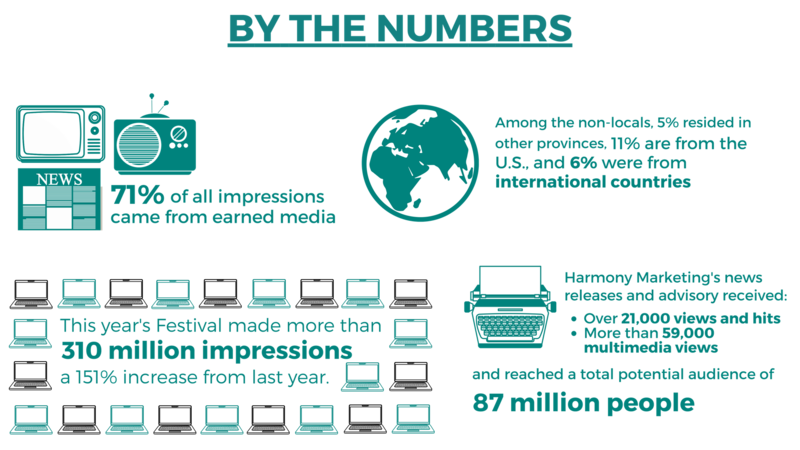 This included significant earned media coverage from local and national outlets such as Global News, Breakfast Television Toronto, CBC Radio, and CP24. The event attracted tourists from many regions with 31 percent residing more than 40 km away from the event site. Among the non-locals, five percent resided in other provinces, 11 percent were from the United States, and six percent were international travelers. Multi-lingual And Omni-Channel Support: Besides offering a distribution platform, Harmony Marketing noted that Cision was able to accommodate bilingual messaging and access to French media, which was new to the strategy. 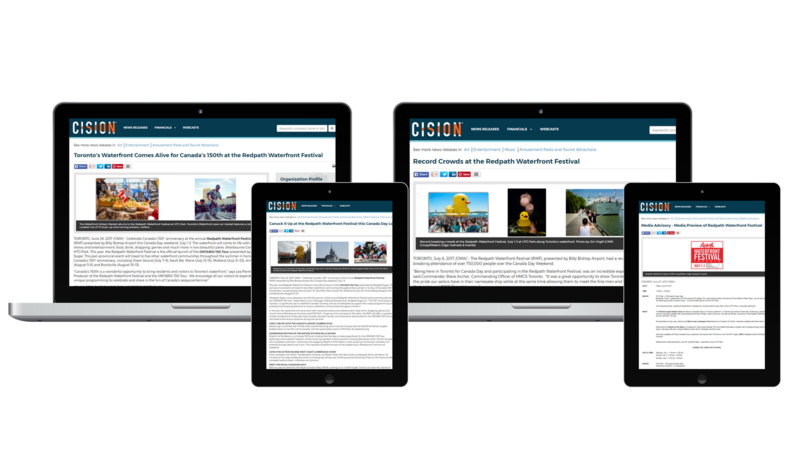 The team also benefited from visibility on the Newswire.ca home page and tweets from Cision that boosted awareness about the duck and the Redpath Waterfront Festival’s overall programming. Quick And Easy Access To Insights: Harmony is a small team, Syme and Bruce explain. There’s no one to whom they can delegate analytics duties. Top-Tier Service: In the heat of promoting a major event, there’s no time for troubleshooting. Harmony Marketing describes Cision as a hands-on, always-available partner in its success. 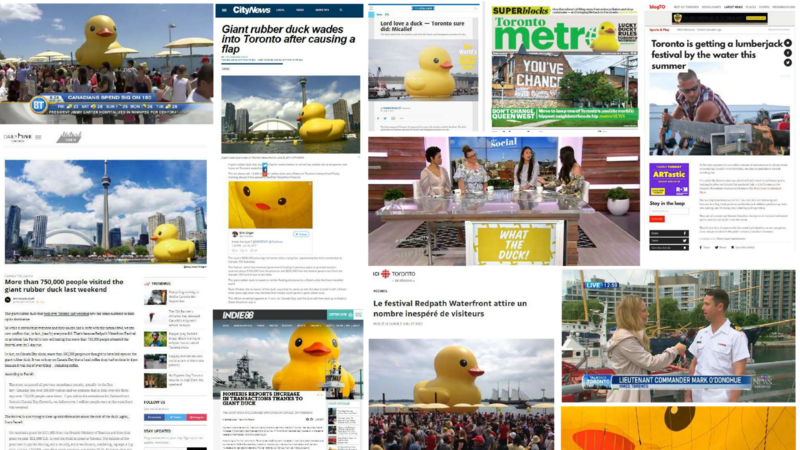 By providing greater education about the duck’s funding sources through a follow-up release, Harmony Marketing watched as newspapers like The Toronto Star ran headlines such as, ‘Giant duck gives Toronto’s waterfront a boost.’ In fact, the Redpath Waterfront Festival broke its three-day attendance record in 2017, driving huge numbers of tourists to local businesses.